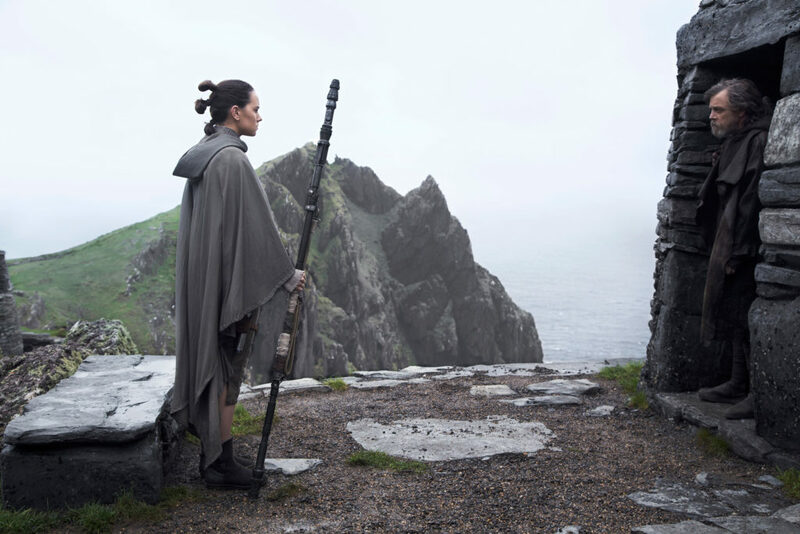 After the unnecessary, casualty-heavy battle against the First Order we return to the planet Ahch-To, where we last saw Rey handing Luke his old lightsaber at the end of The Force Awakens. Waiting the last two years to find out what happens next was excruciating. Even during the space battle it was hard to not think about what was going to happen next. What would he do when he took the lightsaber? What would he say? Well, as we all know, Luke takes it and tosses it over his shoulder as he blows past Rey to leave her standing dumbfounded. I have to say, this was pretty surprising. With all the things we’ve all thought and wondered about what would happen I don’t know anyone who guessed this. While it’s shocking and surprising I’m not really sure why it happened. Sure it sets the tone for the rest of the interaction we’ll see between Luke and Rey but it is still a pretty big letdown after all the anticipation. 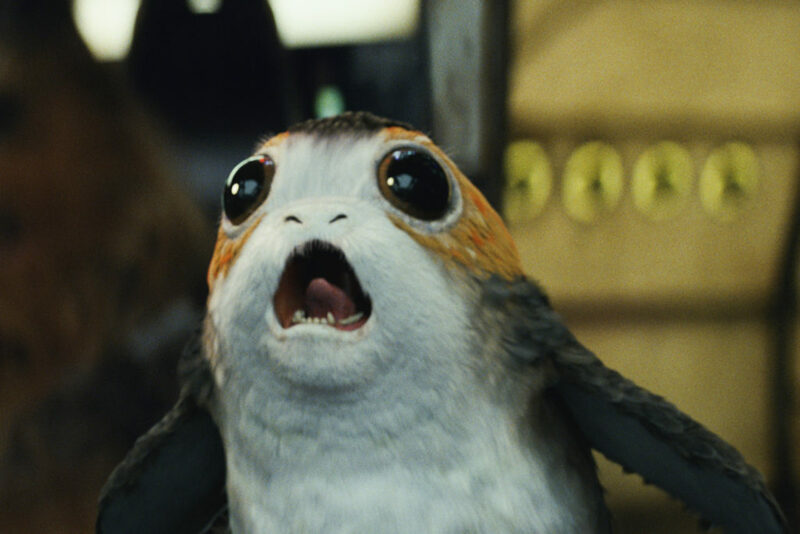 While all this is going on we see Porgs everywhere. They are like an infestation on this planet that we somehow missed at the end of The Force Awakens. They’re like Ewoks if Ewoks were cuter and served far less of a point in the plot. While I avoided all spoilers, trailers, and fan theories going into this movie it was impossible to avoid that the Porgs would be coming so when I saw them I expected them to have some sort of purpose to the story. Apparently the only thing they were there for was to almost kill each other with a lightsaber and to make Chewbacca feel guilty about being a carnivore. Rey then follows Luke around the island a bunch. He sort of meanders around the island, balances on a super long stick, and catches a comically large fish. He’s like Goku in the first episode of Dragon Ball if Goku was 50 years older and really grumpy. Eventually Chewbacca meets up with them much to Luke’s surprise. He is also completely unaware of Han Solo’s fate. This sort of bothered me. Han Solo is Luke Skywalker’s best friend, right? He’s also the husband (estranged or not) of his twin sister and father to his nephew. How did Luke not sense Han’s death? Either he was willfully “turning off” his Force sensitivity or he just didn’t have the ability to sense it. I don’t like any of those answers. I’ve heard that Mark Hamill was not entirely happy with the direction Luke Skywalker took in this movie and early on in the movie it becomes apparent why. 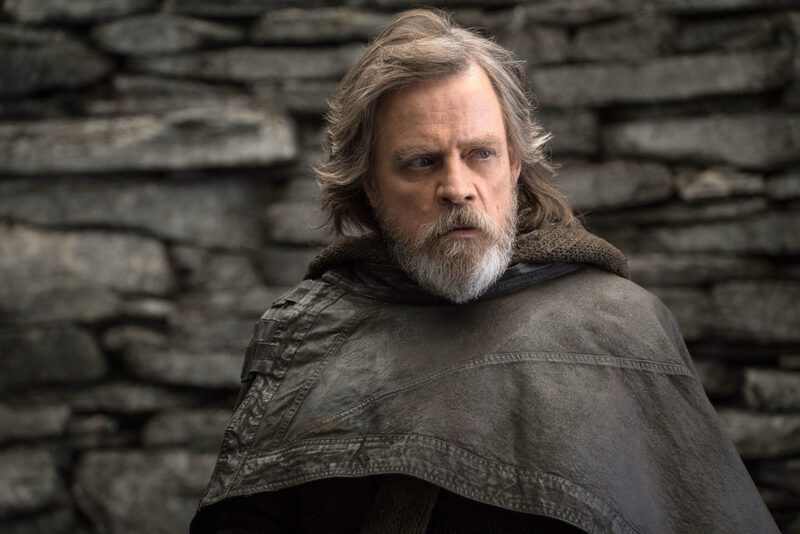 Luke Skywalker was a whiny, annoying kid in the original movies but by Return of the Jedi we’ve seen a huge amount of maturing and he turns into someone you would think would be worthy of being called a Jedi. 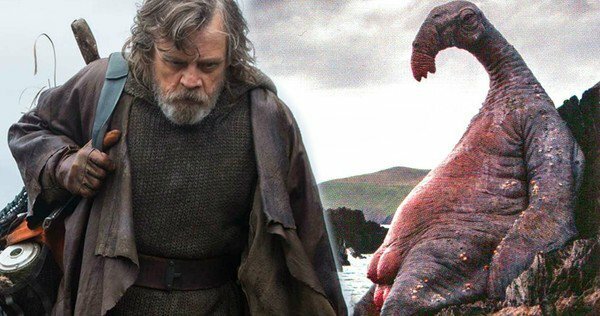 In The Last Jedi Luke is annoyed, grumpy, sarcastic, and exhausted. We are left wondering if Rey can be the one that turns him around and makes him back into the man he once was. One thing is for sure, the Jedi seem to be quitters. Yoda’s self imposed exile seems fine during The Empire Strikes Back but when we see how he came to that exile in Revenge of the Sith we can’t help but wonder why Yoda is so lame. We were told Yoda was a great warrior. Apparently the way he shows that is by trying to stop a bad guy one time, failing, then just giving up and going off to die on a remote planet. Apparently this is something Luke learned from his old master. If things don’t go your way in the epic struggle against evil just leave. Run away, give up, leave your friends to die, let your sister tirelessly fight alone without your help. After all, you’re a Jedi, how could you possible help? Why don’t you just drink blue milk out of the teat of some grumpy, vaguely humanoid alien for the rest of your life instead of standing up for what you believe in? That’s the way of the Jedi. Fight to the death? No way! That’s too dangerous! It’s much easier to run away and feel sorry for yourself for the rest of your life. That’s’s the classic hero’s journey. I’m starting to think that a better ending for Obi-Wan in A New Hope would have been Obi-Wan simply sprinting down the hallway in the Death Star and jumping in an escape pod to get away from Darth Vader never to be seen again. Apparently Obi-Wan would have benefited from the ancient Jedi texts that Yoda and Luke both had access to. Next up . . . The chase is on! 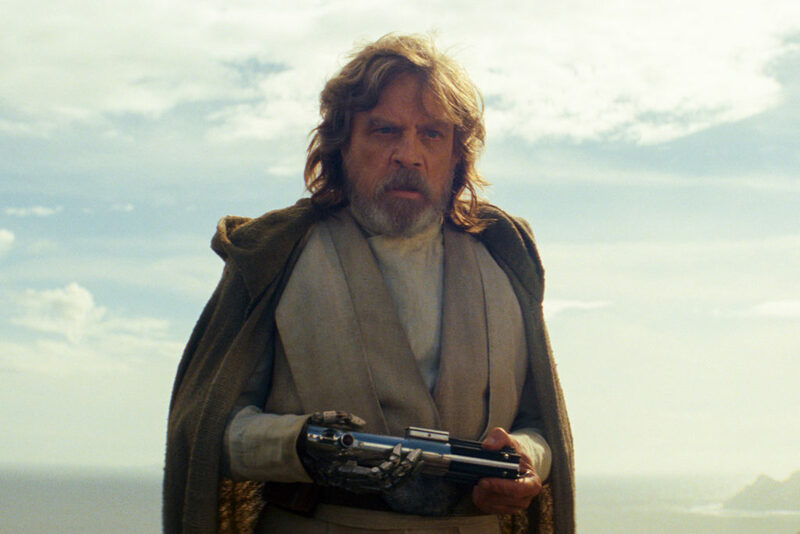 Re: not knowing what happened to Han, that’s actually a plot point–that’s part of what makes Rey realize Luke cut himself off from the Force. Yes, upon watching it a second time I see that. I’m still not in love with the idea that Luke can, or is able to, do that but it is explained in the film. This passage is vintage chefelf right here. Agreed. Apparently his friends mean nothing to him anymore because he failed one time. Yayyy! The Chef Elf has returned. Strikes back. Is Menacing. Attacks. Solo! Thanks for this practical opinion on what is usually a forgotten topic. Mind if I link this with my followers?